Koh Phi Phi is the collective name for a cluster of six islands included in the Mu Koh Phi Phi-Nopparathara National Park. Only 45 minutes from Phuket, Koh Phi Phi features towering limestone cliffs that shelter white, sandy beaches and spectacular, aquamarine bays. The waters surrounding the islands are filled with exotic marine life, including docile leopard sharks, and snorkelling and diving day trips rival lounging on the beach as top activities on Koh Phi Phi. 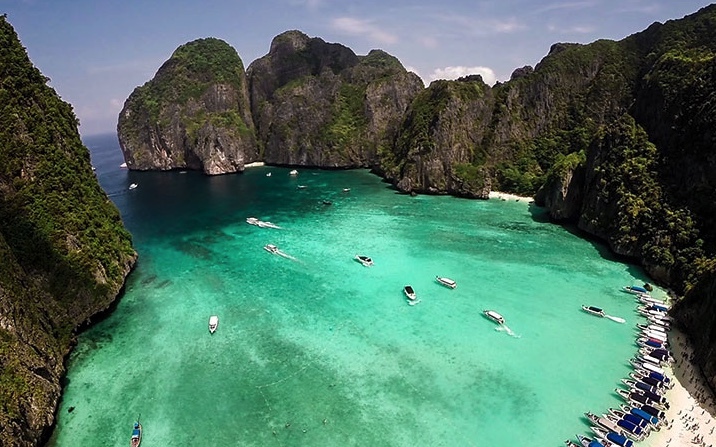 As one of the premier island destinations in Thailand, Koh Phi Phi features both five-star resorts and budget beach bungalows; and both vibrant nightlife and secluded isolation, depending on which beach you choose to stay at. Nowhere in Thailand, perhaps the world, are there so many opportunities for visitors to find exactly the right beach holiday they are looking for within a setting of such spectacular natural beauty. Whether you enjoy scuba diving, snorkeling, or simply relaxing in a hammock, Koh Phi Phi has a beach that will exceed your wildest dreams. The best time to visit Koh Phi Phi is between November and April when the weather is more temperate and the rains are less frequent.